I decided not to fight this election and to spend more time with my family – having checked carefully that they were prepared to spend more time with me. As a result, I had very little involvement in the election other than as an interested observer. And it was in this capacity that I was left baffled and disturbed by the absence of any real focus on the rising levels of poverty caused by the most brutal cut in benefits since the creation of the welfare state. Overall poverty, which hit 12.5 million in the 1980s and 14 million in the mid-1990s before going into decline under Labour is now set to reach a new high this year rising to over 15 million by 2022. According to the House of Commons library these overall trends mask striking differences between age groups. The proportion of pensioners in poverty is much lower now than during the 1960’s, when consistent data began to be collected; but the poverty rates for children and working age adults are higher than they were 50 years ago. This year inflation is set to hit three per cent but the freeze on working age benefits will continue and would probably not have been unfrozen to any great degree if Jeremy Corbyn had become prime minister. In essence therefore, whilst the focus was on threats to pensioners’ income, both main political parties in the election supported a real term pay cut for the working age poor. As Gordon Brown has recently pointed out, despite a 35 per cent rise in prices this decade, child benefit will have increased by only two per cent; housing benefit no longer covers the rent, heating allowances fail to meet the cost of fuel and crisis loans that used to provide emergency access to cookers or beds have been comprehensively shredded. With wages stagnant, the “just about managing” are soon to be the “just about sinking” yet their predicament barely figured in the election beyond platitudinous references to the need for “fairness”. Whilst concern for the poor is commonly expressed, taking measures to improve their condition has rarely been seen as a recipe for winning a general election. This is largely because of the scandalous misrepresentation of poverty as being some kind of lifestyle choice. This artifice reached a new and disgraceful zenith under the Cameron/Osborne regime. The poor are powerless to fight back against this propaganda. Being poor means being powerless. Those who are poor don’t wish to be defined by their poverty. There is no solidarity amongst the impoverished; no National Union of Poor Workers – but there is the Joseph Rowntree Foundation. As politicians debate, what needs to be done there is a tendency to focus on what might work in the future rather than refining and resourcing what has worked in the past. We look for new solutions while those that are tried and tested rust in a scrapyard of previous initiatives condemned because they cannot be described at fresh thinking or because, in the language of political tribalism, they weren’t invented here. The national minimum wage is one of them. A policy championed by Keir Hardie as a founding principle of the Labour Party but which was opposed by the TUC in the seventies and the Conservative Party in the 1980s and 1990s. Its introduction via the Low Pay Commission was necessarily careful and gradual but it’s now a fundamental bedrock of the fight against poverty. It is, in effect, part of the modern welfare state which demonstrated its importance during the aftermath of Lehman Brothers. As Tom Clark, the editor of Prospect magazine, has pointed out, when the crash of 2008 happened the welfare system created by Attlee and supplemented by subsequent governments came into its own. Although more GDP vanished than in any previous post-war slump, inequality didn’t immediately increase. Indeed, for a brief period it actually fell: far fewer jobs were lost and not as many evictions occurred than in the more modest dip of the 1990’s. Crime, which had increased dramatically in previous recessions carried on falling. That’s largely because the automatic stabilisers kicked in, maintaining spending power in recession-lashed communities. But there was an important addition. As well as payment for the temporarily unemployed and child benefit, there was now the tax credit system to top up shrinking pay and bespoke tweaks to income support to help jobless families to pay the mortgage. The government of Gordon Brown and, for a short period, the coalition notched up benefits in line with inflation, the formula accepted by governments of all political persuasions for as long as anybody could remember. The response to this demonstrable success of a system built and improved by successive governments was to begin to dismantle it. Prosperous politicians disgracefully traduced the poor as people living in households where the blinds stayed down in the early morning while their neighbours went off to work. Television programmes like Benefits Street began to portray the welfare state not as a means of overcoming the problems caused by the banks but as a problem in itself. On the left we began to explore the idea of introducing a universal basic income apparently oblivious to the fact that tax credits were introduced specifically to provide a secure stream of income for families with children whether in or out of work – the principal attribute claimed for UBI by its advocates. Why don’t we resolve to ensure this works properly before looking for solutions in the expensive world of fantasy politics? As always, The Joseph Rowntree Foundation is a haven of good sense and muscular practicality. They published their long-term plan to eradicate poverty last September and its five-points are fully grounded in reality. This policy is comfortably situated in the land of the achievable recognising that if we record the incremental advances of progressive politics we’ll know what works and therefore what we need to do more of. The JRF has never stopped building out of the slime. It’s time for the rest of us to lend a hand. 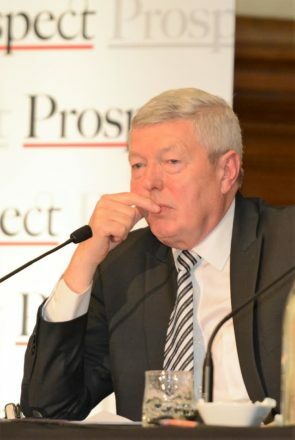 This is an edited version of the annual Joseph Rowntree Foundation/Prospect lecture delivered by Alan Johnson this week. You can read the full speech here.